Professor Jayashankar Telangana State Agricultural University (PJTSAU), Hyderabad has issued the B.Sc.(Hons.) 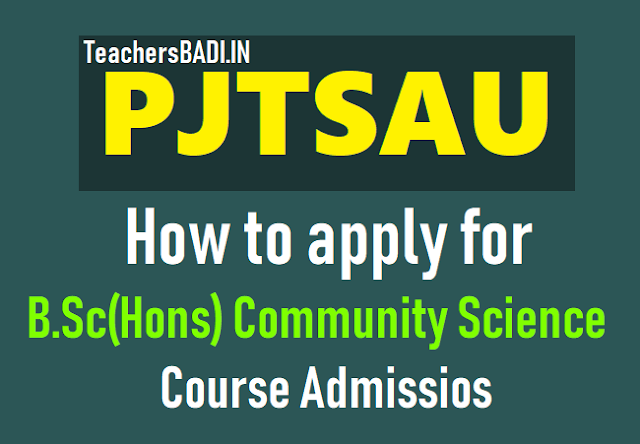 Community Science course admission 2018 notification and Applications are invited for admission into B.Sc.(Hons.) Community Science (Girls Only) course for the Academic 2018-19 and Last Date for application sbmission is 30-06-2018. It is the sole responsibility of the applicant to ensure that he/she fulfils the specified eligibility criteria before submitting the online application. After successful submission of the application form, an application number will be generated and this can be used for future reference. The scanned passport size (3.5 cm x 4.5 cm) photograph of the applicant should be in JPEG format and not exceed 1 Mb file size. The applicant signature should be scanned in JPEG/PNG/JPG format of [3.5 cm x1.5 cm] and not exceed 1 Mb file size. Bonafide / Study Certificate from 4th to 12th Class. Payment of application fee: Rs.1600/- OC & BCs (in case of SC/ST/PH candidates Rs.850/-). The applicant has to select Debit Card /Credit Card (Visa / Master Card)/NET banking option to pay the fee and follow the online instruction to complete the payment of fee. No correspondence with the applicants will be entertained. For any information not mentioned in the PROSPECTUS, , the applicants may contact Tel. No. 8480743506 and 8480427854 between 10:00 A.M. to 07:00 P.M. (Monday to Saturday).